Class times vary daily. Mornings Recommended. Our World-Class Introductory Stand Up Paddle (SUP) Lessons are held in the beautiful reef protected blue-water lagoon adjacent to our surf safari shop location. The crystal-clear coral laden waters provide an idyllic flat-water playground for learning and recreation. When you combine this with our reputed Olympic Caliber instruction, your success and fun is guaranteed. Instruction, your success, and fun is guaranteed. SUP is easy to learn in one lesson and is amazing for building and strengthening balance, core, posture, circulation, breathing, relaxation and discovering a new mode of water transportation. The lessons presented in this course will give you a solid foundation and allow you to make rapid progress in the sport. It will be one of your most memorable vacation excursions, one you can relive at home on any body of calm water. Lessons are scheduled daily, early morning recommended. Instruction will cover a thorough introduction to SUP boards and paddles and match you with the best equipment possible for your lesson. Emphasis on safety is a priority. We will cover the fundamentals of paddle and stroke technique, board control, navigation, and ocean condition assessment on the beach and in the shallows. Next, you will embark out onto the lagoon to practice, learn, and explore. Your instructor will be close and guide you as you improve your newfound skills and enjoy the amazing views of local marine life and mountain island seascapes. 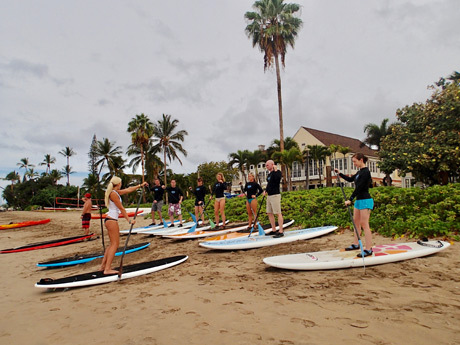 Standup Paddle (SUP) Lessons: Learn to Standup Paddle and experience for yourself the fun and exhilaration of this truly exceptional activity. It’s simple, easy to learn, and fun to do with friends or alone. SUP is an individual water sport that uses a style of paddling similar to that of the outrigger canoe, but you stand upright on a specially designed SUP board and utilize an elongated paddle. Standup paddling has been practiced for centuries in a variety of forms and cultures and in its recent modernized version has become one of the most popular and fastest growing water sports in the WORLD. It is extremely unique in that you can self-propel while standing across any body of water that skill level warrants without the necessity of wind, waves, or engine power. Participation is hugely rewarding as you captain your own board and navigate to your own chosen course or destination while reaping the benefits of a great low-impact full body workout. Maui boasts a world-class variety of water terrain for every level of participant. Due to ever changing ocean conditions hiring an instructor or guide is highly recommended. 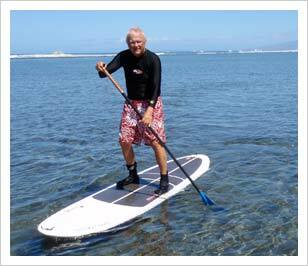 Get twice the experience by adding a snorkel session to your Stand Up Paddle lesson.